Where experts turn for definitive answers! 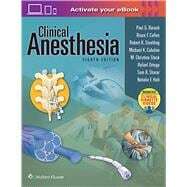 Clinical Anesthesia covers the full spectrum of clinical issues and options in anesthesiology, providing insightful coverage of pharmacology, physiology, co-existing diseases, and surgical procedures. Unmatched in its clarity and depth of coverage as well as its robust multimedia features, this classic clinical reference brings you the very latest essential knowledge in the field, equipping you to effectively apply today’s standards of care and make optimal clinical decisions on behalf of your patients. Advance your skills with 180 new Narrated Interactive Clinical Vignettes – which immerse you in a virtual classroom setting where a master teacher guides you through a focused discussion on common and uncommon clinical topics. A clinical question is posed, and you are given time to develop an appropriate answer. Then, in a stepwise fashion, you will see and hear the answer unfold. In addition to the Interactive vignettes, the ebook also comes with a collection of over 300 procedural videos to help hone your technique.